Equip your recruits with a biblical and practical perspective of personal support raising. 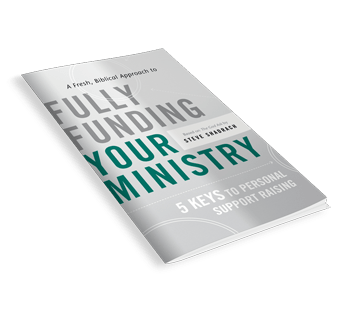 This 8 page booklet will calm their fears and quickly unpack the basic how-to’s to fully funding their ministry. For 100 booklets, order a quantity of 10. For 500 booklets, order a quantity of 50. Take some time to study the Scriptures for yourself so you will know exactly what God thinks about asking others to give to you and to your ministry. Some choose to just pray and trust God to bring the funds in. The great George Muller did this to support orphanages in 19th century London. But it is just as biblical and requires as much or more faith to personally invite others to invest. Either way, we have to understand that God is the source of the funds, not the donors, our plans, or hard work. Remember the twelve Hebrew spies who went into the Promised Land to take a look before the whole nation was to enter and claim what God had given them? Only Joshua and Caleb came back ready to invade. The other ten spies were so terrified of the giants that they saw in the land that they confessed, "we became like grasshoppers in our own sight" (Exodus 13:33). Instead of trusting God and moving out with courage, they let fear paralyze them. All of us have different "giants" in our minds that will keep us from beginning and persevering in the process of assembling a full support team. Regardless of what they are, you must kill the giants one at a time as you fill your mind with the Scriptures and believe what God has said about you and your calling. Then you can courageously march in and take the land! Pray--God will go before you. He will also build a love for your donors as you pray for them individually. Create Your Budget--Seek to balance a lifestyle that will allow you to maximize your effectiveness, but also be above reproach. Namestorm--Write down every person that you have ever known during your lifetime, and let God do the work. Map Out a Plan--Divide up all the names according to where they live and decide on an amount for which to ask each person. Plan Out a Map--Figure out what city you'll go to first, second, third, and so on. Make a schedule and call for appointments. This is the key. James 4:2 says, "we have not because we ask not." The word "ask" is used in the gospels 113 times. God wants to teach us about asking: Him and others. It is good, biblical, and faithbuilding to ask. Let's not hide behind our fears. Let's walk toward them and render them powerless! The worst thing they could say is "No." Consider tithing your ministry time to your support team. Thank before you bank. Regularly send well-written newsletters.